New Arlington Decal: Is This A Joke? Is this a joke? If it isn’t, Arlington County apparently expects me to prominently display a sticker on my car featuring that quote. Serving as the background to this quote is a waving American flag, with the Pentagon superimposed. Are you )(*&@#ing kidding me? Now, a bit of background for the 99.5% of my readers not living in Arlington. Arlington County residents pay a property tax on their cars every year, and a decal is issued as evidence of payment of this tax. These decals are placed in the center of the windshield of the car. The Arlington County Treasurer, some number of years ago, decided to hold a competition for the yearly design change. Local high school students submit proposed designs, and then (I believe) Arlington residents who bother to send in a ballot from the Arlington Sun-Gazette or go to the Treasurer’s website vote on it. Some years this yields a rather ugly result, other years it’s fine. This is the current sticker, featuring the new Air Force Memorial. Nice enough. I find this new design unbelievable on a number of levels, including the fact that it actually garnered the most votes from Arlington residents. I’m going to choose to believe that those voting for it simply couldn’t read the quote, and just liked the American flag and Pentagon (which is located in Arlington). That’s ugly, but fine. 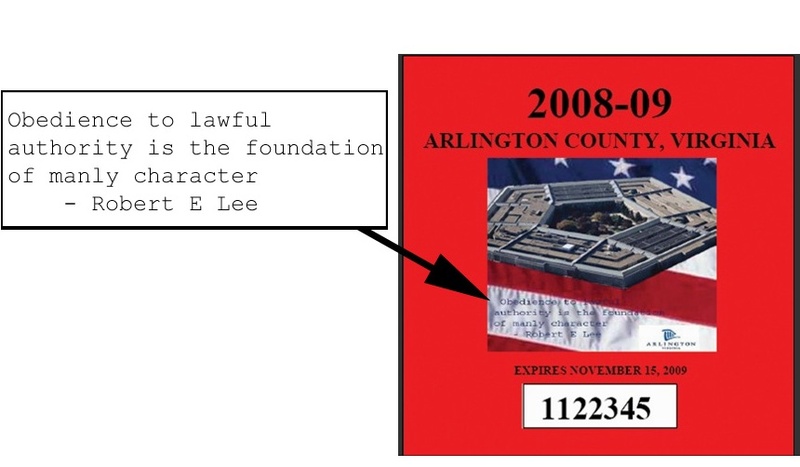 But what in the world made Arlington Treasurer Frank O’Leary think that a design featuring a Confederate general’s quote about submitting to authority with the flag and Pentagon in the background is appropriate for Arlington? Sure, the final designs were voted on by Arlington residents, but the pool of finalists was selected by his office in the first place. That quote – which, by the way, comes from here – is something you’ll never see on my car. I – and I hope you, if you live in Arlington – will be in touch with Mr. O’Leary soon. Note: as soon as I can find a graphic of the decal, I’ll post it here. Until then, the first link to the Sun Gazette story is the best place to find a picture. Also, while I find this an unacceptably inappropriate design for a public application, I don’t mean to criticize, in any way, the student that came up with it. Update: I just got off the phone with Mr. O’Leary (you can’t fault Arlington government for being inaccessible). The short version: There are no plans for an alternative design, but Arlington residents are free to cut out the picture/quote from the center of the sticker. So long as the number is displayed, he views it as a valid sticker and isn’t aware of any ordinance to the contrary. Is that enough? Or should Arlington be reconsidering whether this is what we want to pay to have manufactured and displayed on every car in the county? We’ll see. Going Once, Twice . . .
No, I quite enjoy paying $24 for the pleasure of slapping an offensive bit of pointless plastic onto my windshield. However, if you can promise no winter days below 50, we might be onto something . . .
You know, it occurred to me that it’s unlikely anyone would check to see if I’m an Arlington resident, and since Fairfax doesn’t do the decals, what’s to stop me from simply failing to put the silly thing on my car? And of course consider that when this quote was uttered, obedience to lawful authority included turning in runaway slaves, hanging abolitionists, and of course if you were a woman, it meant NOT voting. Good thing everyone obeyed the law! Ahh Tony T, please do a little research on the man before you speak. We should not be upset at what the sticker says but what the sticker implies. Why do we pay taxes and are forced to purchase a sticker which guarantees our right to drive and park our vehicle in Arlington County? To me that is more upsetting. I am also a county resident. I just found out about this from the Sun Gazette, which carried aletter to the editor objecting to the sticker. This was the first I heard of the quote. I did indeed see the sticker candidates in the paper when the contest was announced, and indeed, I didn’t notice the quote if it was even legible in the printed newspaper at that time. None of the designs grabbed me and I didn’t bother to vote. Believe me, had I realized the content of this sticker design I would have been on the horn to the county right there and then. Thee is no excuse for something like this even making it into the selected designs to be submitted for vote. What is Mr. O’Leary thinking, to send out a quote touting obedience and “manliness” from a Confederate culture hero to Arlington’s many black citizens, let alone the entire half of the population, all races, that is female? I do not blame the student who designed the sticker; mature judgment is not necessarily to be expected from young people, but from our elected officials it is. I would also point out that obedience is not particularly an American value. In fact, elevating obedience to high in the canon of virtues is distinctly un-American. Had George Washington, Thomas Jefferson, Patrick Henry, George Mason and other heroes of the American revolution taken the above view on obedience, Arlington would still be part of an obedient colony to Great Britian, I daresay. Had heroes like Harriet Tubman, Susan B. Anthony, Roas Parks and the ev. Dr. Martin Luther King viewed obedience as a supreme value, black and female citizens would still be non-citizens in effect. IAnd I would mention, as did the author of the letter to the editor in the Sun Gazette, that Robert E. Lee himself broke his oath to obey duly constituted authority when he chose to go with the rebel cause. Finally, while I have sympathy and compassion for the man and for many others who fought on that side, for my government to endorse Robert E.Lee as an authority on character is deeply offensive to someone whose ancestors also fought gallantly — to preserve the Union of which we are citizens today. Offering gracious permission for us to remove these words is no compensation for our having parently paid our public servants out of our tax dollars to choose, print and distribute this offensive rubbish to every automobile owner in the county, bearing the county imprimatur. I am sure Mr. O’Leary is thinking of money no doubty already spent. This is no time to throw good money after bad. There are times when officials make mistakes and need to admit it and need to do whatever is necessary to set the matter right. This is one of those times. Mr. O’Leary’s office is an elected one, by the way. He has held it for so many years, usually running unopposed, that it may seem secure, but that could change. By the way, I can testify as a citizen that if you don’t have a county sticker, they will catch you, eventually. This happened to me once when I forgot to renew. Since leaving the previous comment, I have spoken to an official with the Arlington County Treaurer’s Office, who advises me that the quote in question will not, in fact, appear on the decal. Apparently besides being too small to show up clearly on the website, the lettering was too small for printing on the stickers in any case. I for one am much relieved.